My lovely friend makes beautiful handmade items, including personalised keepsakes, all perfectly embroidered with exquisite details. Her Precious Time Memories Facebook Page contains lovely, unique ideas and she has lots of fantastic teacher gifts available right now. If you are stuck for ideas for presents, it's a great place to visit. 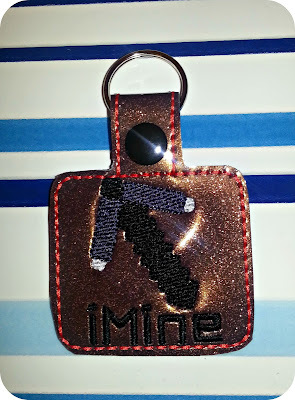 She has kindly offered this fantastic handmade Minecraft keyring to one lucky winner, via the Rafflecopter widget below. I like the unicorn with the name, time, weight etc on. The pink & white unicorns are fab! I love the unicorns, they're so cute! I love the best teacher items!